There’s no business like dog show business! Here are some great pooch fests coming to Long Island this year and the kennel clubs that sponsor them. BROOKHAVEN KENNEL CLUB, Lake Grove, 631-667-0776. Hosts one match show every spring. GRATEFUL GREYHOUNDS, Belmont Lake State Park, North Babylon, gratefulgreys.org, 516-735-5070. Sept. 15, 11 a.m.-3 p.m., lunch, merchandise, events, meet adoptable greyhounds. Fee $15 donation. LADIES’ KENNEL ASSOCIATION OF AMERICA, 631-928-1517, lkaa.org AKC agility trials, Oct. 6-7, Doggie U, 1515 5th Industrial Court, Bay Shore, see website for schedule. Fee Free. LONG ISLAND KENNEL CLUB, 135 High Farms Rd., Old Brookville, longislanddogshows.org, 347-450-5452. 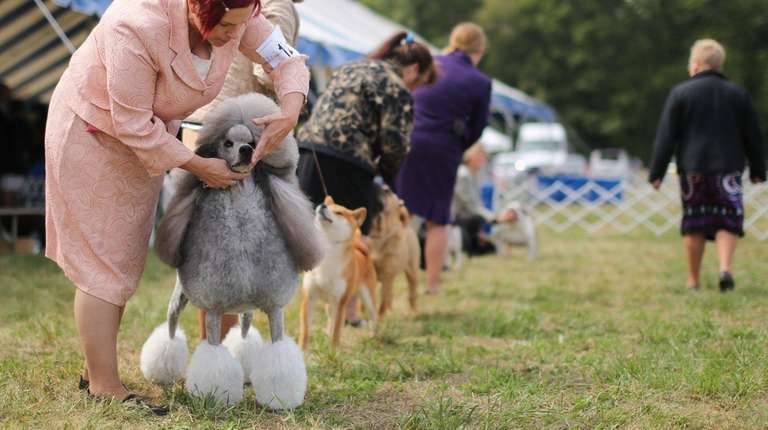 May 18-20, AKC conformation show, all-breed dog show, breed showcase, junior showmanship, “My Dog Can Do That” event, Dock Dogs jumping competition, Planting Fields Arboretum, Oyster Bay. Fee $20 carload, includes admission to the Planting Fields. NASSAU DOG TRAINING CLUB, 68 Lincoln Rd., Franklin Square, nassaudogtrainingclub.com, 516-250-4312. Sept. 30, AKC obedience trial at Planting Fields Arboretum, Oyster Bay. NORTH FORK DOCK DIVING PET EXPO thegivingtank.org/northforkdogdockdiving, 631-447-1518, 631-477-1100. June 2-3, Greenport Harbor Brewing Co., 42155 Main Rd., Peconic, 9 a.m.-5 p.m., presented by Harbor Pet and Greenport Harbor Brewing Co., free admission for spectators, cost for dogs to dive see website for details and to register your dog. SUFFOLK COUNTY KENNEL CLUB, 631-231-6457, suffolkcountykennelclub.org July 29, 11th annual Canine Experience Event, 9 a.m.- 2 p.m., Smithtown Historical Society, Smithtown. More than 15 breed clubs provide instruction, clinics and demonstrations. Fee Donations appreciated. Sept. 29, 80th annual championship show, 8:30 a.m.-3 p.m., Smithtown Historical Society, Smithtown, agility demonstrations, vendors, conformation competition, education tent. Fee $10 a person, $20 per carload (look for discount coupons on website). SUFFOLK OBEDIENCE TRAINING CLUB, Deer Park, 631-261-6554, suffolkobedience.com June 30- July 1, Obedience trial, training facility, 60-62 S. Second St., Deer Park. Check website for upcoming events. WESTBURY KENNEL ASSOCIATION, Westbury, 516-922-3541. Sept. 30, two big back-to-back all-breed AKC dog shows, morning and afternoon, 8 a.m.-5:30 p.m., Planting Fields Arboretum, Oyster Bay. Over 900 dogs from more than 100 breeds competing for championship titles. Plus obedience competition, guided show-tent tour, education booth, raffle prizes, food tent and pet related vendors (new vendor applications welcome) Includes obedience competition, new and rare breeds showcase, vendors, educational services. Fee $10 a person or $20 per carload. Here are all of the dog parks on Long IslandFrom amenities to park tips, we've rounded up everything you need to know before you take Fido out for an afternoon of outdoor fun. 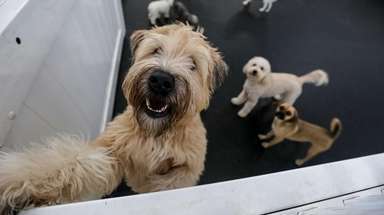 See some of the most pet-friendly spots on LIIf you're looking to bring Spot to a spot, these places have made the declaration "Yes, dogs allowed." More than 50 furry friends available for adoption nowThinking about adopting a pet? These Long Island shelter dogs are looking for forever homes.